The landscape of healthcare marketing and the strategies needed to increase patient acquisition are rapidly evolving, as prospective patients are becoming avid researchers looking to gather as much information on a practice as possible before ever picking up the phone or walking into a facility. With competition continually increasing, its more critical than ever for private practices to invest in their branding and market outreach in order to build trust and credibility with this prospective audience. With many competitors touting similar benefits – great care, high-touch service, the latest technology – it can become very tough to create differentiation and ultimately build trust with the market. This is where a strong branding and marketing awareness campaign can have a substantial impact. A strong brand can pre-sell a buyer, reinforce a purchase decision and help forge an emotional link that binds a buyer to a brand for years to come. Finding ways to connect emotionally with prospective patients – whether through tactics to humanize the doctors, communicate patient stories in a compelling way or provide valuable and educational content – can be the first step to establishing a practice as a leader in its area of focus. Since 2011, we have worked with Chesapeake Eye Care and Laser Center of Annapolis to create a brand identity that would set their vision care practice apart from the competition and position them for growth. Working closely with the principals of the practice and the marketing director, we developed a strong, cohesive brand image that has been successfully carried out in a range of marketing initiatives, including print and digital advertising, a new website, social media, collateral materials, sponsorships and community outreach. The first advertising campaign – which continues to be featured in newspaper, magazine and digital media and is supported through promotion in their social media outlets – features custom photography of their skilled doctors and content that humanizes the practice and describes their experience performing a range of specialized eye care surgeries and cosmetic procedures. In addition, a testimonial ad campaign was created to extend recognition of the brand throughout the region. This campaign, which was honored with a Healthcare Advertising Award, features current patients with their doctors and highlights the success of vision procedures. Showing patients in real-life settings, resuming activities they couldn’t enjoy prior to their treatment, reinforces the message. Over the years, we developed campaigns highlighting many cutting-edge procedures, including LASIK®, Raindrop®, cataract and eyelid surgeries. 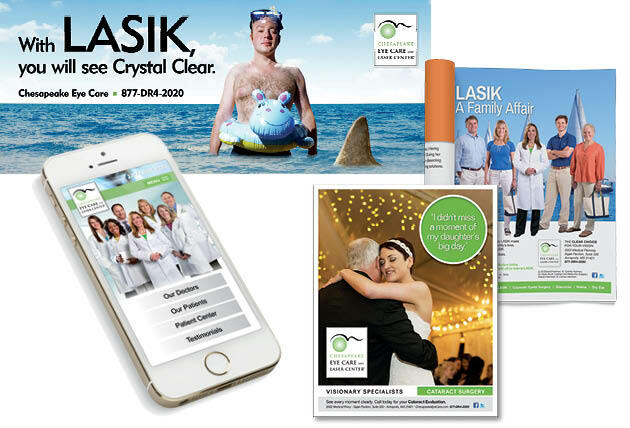 We also reinforced the Chesapeake Eye Care brand through collateral pieces, including posters, signage, brochures and other materials distributed to patients. Additionally, Herrmann redesigned Chesapeake Eye Care’s new website (www.chesapeakeyecare.com) to coordinate with their new brand look. We updated the programming structure of the practice’s desktop site to take advantage of responsive programming, thus optimizing it for display on tablets and mobile devices. Continued expansion of the practice and its desire to extend its services to Spanish-speaking patients prompted a major website update, launched in 2017, that allows visitors to view content in English or Spanish. The bilingual site reflects the practice’s internal commitment to providing bilingual services at every patient touchpoint – from the call center and front desk to examinations and surgical procedures. Chesapeake Eye Care’s reputation as leader in vision care ultimately led to its recent expansion through multiple mergers and acquisitions across the Mid-Atlantic area. Herrmann continues to work with the practice on a variety of ongoing, strategic branding initiatives to further increase awareness and build trust with prospective patients. For more information on how Herrmann can help your healthcare brand, please reach out to our Chief Business Development Officer, John Albert. John can be reached at 410.267.6522 x252 or john@herrmann.com. Herrmann is happy to provide marketing, advertising and website audits, along with relevant, useful information on how Herrmann can help elevate your brand.